Some take-aways from WIPO’s first three legal rights objection decisions. 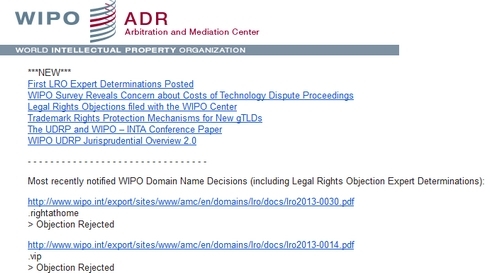 WIPO has published the results of three legal rights objections for new TLDs. Objectors to .home, .vip, and .rightathome all lost their cases. Here are eight observations from the first three cases. Hey there, WIPO UDRP panelists! The first three decided legal rights objections were handled by some familiar names if you follow UDRP proceedings. Tony Willoughby was the panelist for .vip, Robert A Badgley handled .rightathome, and M. Scott Donahey decided .home. Remember all those companies that tried to get trademarks on new TLDs from the U.S. Patent and Trademark office? The USPTO said no, but applicants went to other jurisdictions to try to “front run” the new TLD process. So far, panelists are on to this. They’re calling B.S. on applicants’ assertions that they were actually using these marks in commerce and not just acquiring them to get a leg up on new TLDs. In the .home case, the panelist even reconstructed the timeline of trademark filings and the new TLD program to show how questionable the objector’s claims were. Oh, and remember how you didn’t fool the USPTO with your Wild West Domains reseller accounts? Apparently panelists at WIPO aren’t that dumb, either. Officially, there’s no such think as Reverse TLD Application Hijacking? I believe that most legal rights objections will fail. There’s no equivalent of reverse domain name hijacking for these objections, but two of the first three decided cases (.home and .vip) are certainly candidates. The good news for new TLD applicants: unlike with UDRP, the loser pays in new TLD objections. Is this the start of new TLD lawsuit season? I-Registry Ltd. filed five objections for .vip. It also applied for the string, so it has a lot invested. It lost its first .vip objection and will likely lose the others. With that in mind, will I-Registry Ltd. decide to sue to try to push the issue? I don’t know I-Registry well, but I know some other applicants who are upset that others had the same idea as them for new TLDs and are sure to use every available means to try to capture their prize. Even if they ultimately lose, it will frustrate other applicants. We don’t yet know if decisions will be consistent. Speaking of .vip, what would happen if a panelist found in I-Registry’s favor in a later case? I suspect WIPO put the same panelist on all .vip cases. But since this is a new process, we are bound to see decisions by some panelists that conflict with the rationale used by other panelists on different new TLD strings. You might argue that legal rights objections will be easier to handle than the other types of objections. Still, that WIPO is the first of three new TLD objection forums to turn in results isn’t too surprising. I think the other forums are still trying to understand domains. One is even in hot water for some rather egregious fee estimates. WIPO is including its objection decisions in its daily WIPO mailings. UDRP junkies like me get WIPO’s daily digest of decisions. New TLD objections are included. So if you want to stay on top of these objections, you can subscribe to its mailing list. Both parties to UDRP often complain about the other party filing unrequested supplemental filings. The same goes for new TLD objections, as the parties disagree on whether additional information can be submitted after the fact. Are all objections decided by a one man panel ? (b) Pursuant to Article 13(b)(ii) of the Procedure, there shall be a single-member Panel unless all the Parties agree to the appointment of a three-member Panel. @ John Berryhill – what, that the trademark was sold by another new TLD applicant? Someone was trying this really hard for dot games also. Had all these wonky TM filings in Europe. In the end tried to sell the TM package for 40k not sure how much it cost to create but no one bit and the guy crawled back under the muck he came from.